Windsurfing Equipment | Spin Out! In our brand new Club you can enjoy and ride some of the most expensive and finest windsurfing gear of the market! We use 2016 /2017 Tabou Boards and Gaastra Sails , in a wide range that can cover your level and progress! All rigs and boards are ready to hit the water and give you the best sailing feeling experience. The Bullitt windsurfing board is the great all round free ride board. A durable and affordable solution that comes with a great shape for comfort on the run. A range of boards you can progress on all the way up to making your first jibe and beyond. The shape of Bullitt windsurfing board is based on the standard version of the Rocket range were we have adapted all the parameters (length, rocker etc) to work with this less expensive construction. With a stronger, more forgiving and affordable construction, the boards are easy to ride. Fun for all, regardless of whether you are a beginner, starting to windsurfing again or just want to take a spin on holiday. Soft and easy underfoot and wide enough for easy up hauling. The boards last no longer than the normal Rockets but they are designed so that even the hard “school life” cannot hurt them. The complete range of bullitt windsurfing board in sizes are 125, 135, 145 and 155. This inspiring range of boards makes sailing easy, fun and affordable. Bullitt windsurfing board is the perfect affordable board and in a very robust construction. A variety of strap vpositions offer the possibility to tune the board exactly to your needs. 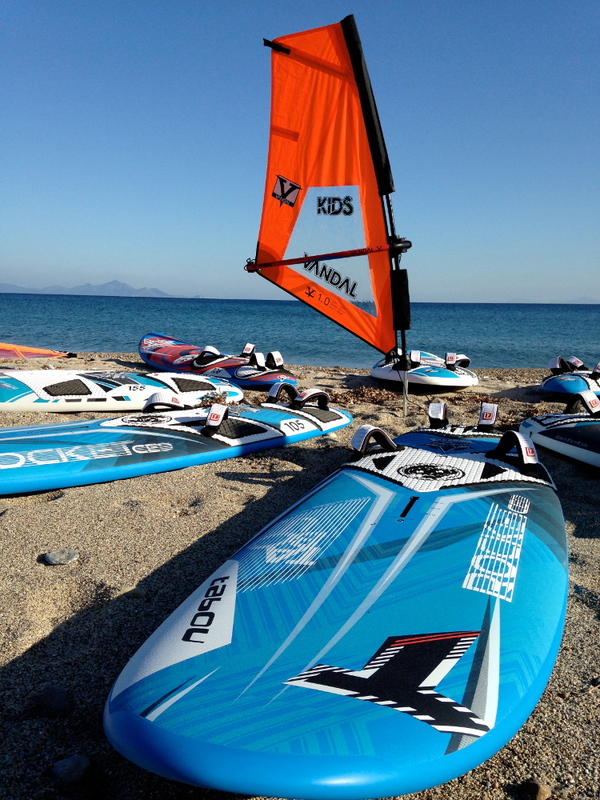 Your easy start into the amazing sport of windsurfing with the Coolrider windsurfing board. Stylish on the beach and cool on the water, this range of boards has everything you need to learn all the tricks for your first time on the water. A new size of 230 is introduced making the first time experience even better. Schools all over the globe have noted the ease of use with this board. We have taken all the feedback from our big surf school team and found the perfect blend of function for what these boards need to do. The focus, of course, is to make it as easy as possible for beginners, but no one has fun with a board that will be boring after 5 days. The EVA deck makes it perfect for beginners and longboard freestyle. The handle in the nose makes it easy to carry to the beach and lots of rubber dampening ensures a long life. Our big bertha, this board is ultra stable because of its 100cm width. It has an ultra- comfortable deck when riding in the center of the board because of the double deck profile. In fact, the dome deck in the center is the deck of our Rocket 135 that has been “glued” on the board in the CAD design program. It gives extra volume in the tail whilst allowing for thinner rail to make jibes easier. Long super smooth CAD design rocker: easy gliding and planing. Wide outline at 100cm making it super stable. 230 liter – can teach anybody. Deep front V, smooth over choppy water. Long dagger board – easy upwind. Double deck in the tail, providing comfort and easy jibing. These shapes remain the same as we updated them last season and they have been well loved by all our shops and schools. Summer fun with the family or just a day at the beach, the Coolrider windsurfing board is the perfect board to have some fun. To win PWA competitions it takes a relentless work ethic both on and off the water. Developing the Manta windsurfing board range is a 365 day per year project. The test team is committed ton on-stop development to ensure the best tools for the job. The new Manta windsurfing board range has all the ingredients to put you on the podium. Our goal is to go faster, turn better and constantly accelerate. The Manta windsurfing board range is a state of the art racing machine. There is no compromise here, when you step on the Manta windsurfing board, you better be ready for the ride of your life. After successful results on our 2014 Manta wind surfing boards, we decided to orientate the R&D in the same direction as before: speed, performance and wind range for each size board to be able to perform whatever the conditions may be. A big goal of ours was to improve the glide of the Mantas for 2015. New tail designs and cuts-out sections to give more water release, improved the top speed but more importantly the acceleration when you get planing. The new boards are also jibing amazingly well, whilst the increased board glide allows us to pass other sailors around marks too. The ultra light and super stiff Team Pro Edition boards are made with the finest materials available to give a serious performance advantage. We changed the pads from 4mm thick to 6mm thick on Mantas 85, 81, 71, 66 and to 8mm thick on Mantas 61 and 59, because comfort makes you faster. We have a new, stronger and stiffer back deck layup to improve durability. This year as we had a very good base to focus work on water release. We tested lot of cut outs and double deck designs, drastically reducing the drag. We also worked on fine tuning the kick on the bigger board. At the end of the R&D process, this has given us boards with better top speed and especially better acceleration and glide out of gybes. We also worked on the control of some of the boards by fine tuning the mast track and footstrap positions. Improved acceleration and jibing characteristics, better high end control and stability. The 2015 Manta windsurfing board is a true demon on all points of the race course. More and more recreational sailors are looking for that magical one board that they can take to the beach any time and in any condition to get out on the water and have fun. The 3S windsurfing board is the “Swiss army knife” of the windsurf world. You can freeride, bump and jump, bust out some freestyle and smack some lips on these boards and they just don’t care. Arguably one of the best all-round boards on the market, the 3S windsurfing board just gets better and better.The key word to describe these boards is “EASY”. The boards just do what you want them to do, you don’t have to work hard to make them turn, they know how to do it. They jump onto the plane with ease and rocket to the moon on the jumps. For 2015 the 96, 106 and 116 have all got a tune up! It was a really difficult process to create something fresh and new without moving away from the core values that the 3S windsurfing board stands for. For these boards we keep the double step tail cutout that accomplishes this task with great success. In a straight line you get the advantage of less wetted surface giving you a higher top speed. When on a wave, when you force water to go on those two steps it works like a kick tail, allowing the board to turn on a much tighter radius. In the end we fine tuned the rocker-line to free the board up even more. Then we also changed the bottom shape to get more power in marginal conditions. All this, together with a new outline, help achieve more stability and better turning. The 3S windsurfing board continues to lead its class with a new compact feel for 2015. This range covers any rider looking to have fun on the water. Available in 76, 86, 96, 106and 116 liter sizes. The double tail cutout gives better top speed and acceleration, shorter radius turns and more versatility. Winger swallow tail outline provides a perfect blend of power for planing and surface distribution for speed and versatility. CAD optimized mega-smooth rocker for planing, speed and versatility. New bottom shape: more power in marginal conditions and more control in high winds. New outline: more stable in the curves; better acceleration. All shapes are available in the ultra light and extreme rigid LTD construction. This gives a significant increase in performance. The boards glide earlier and respond more directly. The Rocket windsurfing board provides a perfect balance of speed and acceleration, maneuverability and control. Rocket Windsurfing Board continues to raise the bar for any free ride board. Our test winning boards prove to be hard to beat this comment coming from the shaper himself. We wanted to make sure these new shapes are noticeably better and we have found more magic. Better performance (faster, earlier planing and better acceleration) without losing any good points from the past. We concentrated on getting better performance while not losing any of the easy side to these boards. To do this we used what we learned about outline and V distribution working with the team with the Manta. So to get more power we have reduced the V in the tail, and to achieve more power in low winds, we have increased the width of the outline around the front foot area while making the tail outline narrower. As a result we get great planing, great acceleration and very good top speed. We kept our signature Tabou nose double concave to get our famous “soft touch” over the chop that makes the boards so easy. We also kept our smooth rocker and rail foil distribution that makes this range so easy and predictable in the turns. Perfect rocker for smoother planing, better non-active planing balance. Balanced V and concave: more acceleration, keeps you planing better through lulls and generates more top speed. More volume and wider in the tail: better acceleration, more power in lulls, better upwind. The Rocket windsurfing board and Rocket LTD are made for freeriders who want it all. More speed, more power, more fun. Try Freetime windsurfing sail, learn it and love it! Pure bliss for beginners, surf schools and holiday resorts. Forgiving, stable and easy to handle, Freetime windsurfing sail is exactly what you need as a beginner. This rig also works well on a SUP board for cruising around. The short luff in combination with a lightweight carbon mast give the freetime windsurfing sail its unique easy-going character. Having a perfect balance is the most important issue in the development of Freetime windsurfing sail. Everybody should have fun on the water as soon as they set foot on a board. Along with the the other rig components specifically developed for this rig, windsurfing is fun and effortless! Introducing the 2015 Vapor windsurfing sail – Race Line up- A lighter and faster sail than anything yet to be produced. More effortless in the hands, superior acceleration with constant forward drive. A straight Leech on slalom sizes 5,2 to 9.6 allows these sails to knife through the wind with less resistance. A Posi Leech on Formula sizes 10,0 11,0 12,5 to keep upwind ability and drive in lighter winds A Higher aspect ratio to capture more wind, turning it into more power. A deeper shape in the lower region and in front along the luff sleeve. More Flexibility in the rig for all sizes giving more control in rough waters. A New 2Ply mast sleeve construction on slalom sizes for more durability. A slightly more narrow Mast sleeve in the top half of the sail for better aerodynamics. An additional vertical luff panel to control the increased shaping down low. 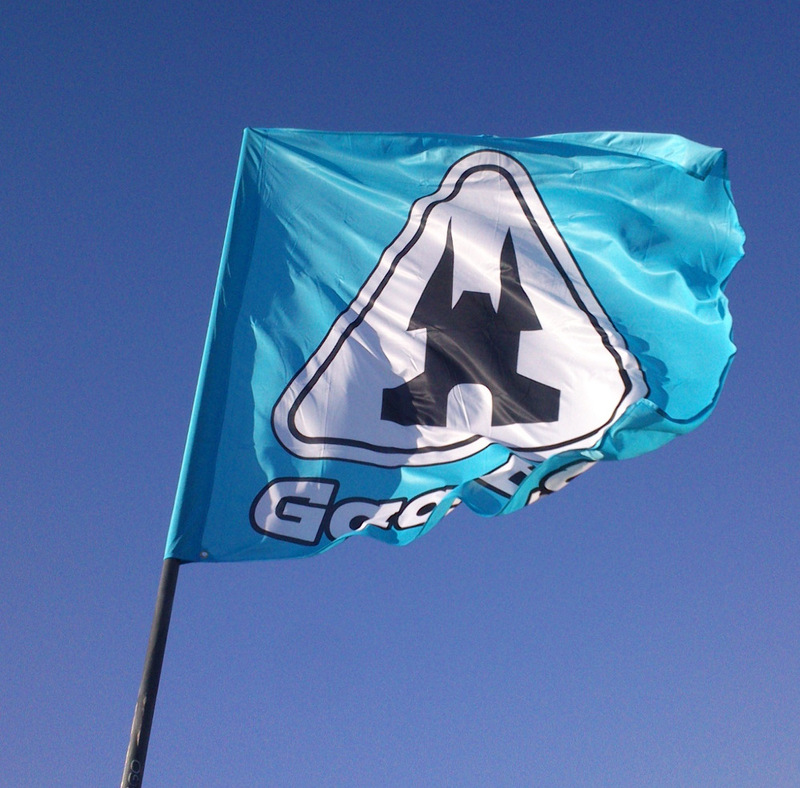 The Vapor windsurfing sail is our no compromise racing sail. The R&D process continues throughout the entire year to keep our riders winning. In 2014, we won the IFCA slalom world title and the Formula world and european championships. The new 2015 models have been beating these sails already for the past months! We can’t wait to get them on the race course! We have implemented our new design features with new outlines, compact batten positioning and stabilized head configurations. On the slalom sizes we adopted a straight leech as it was the best compromise for downwind racing, while on the formula sizes the posi leech works better with its added drive upwind. We increased the aspect ratio on the slalom sails making them more agile around the jibes and with increased shaping in the bottom and in the luff higher up in the Vapor windsurfing sail performance is at a new level. We also worked on the flexibility of the rig fine tuning it for every single size. We changed the mast sleeve material on the slalom sizes and reduced its width in the top half of the sail. On the Formula sizes we redesigned them all and put a new outline with a much smaller head in all the sizes. We changed the batten positioning finding a more efficient upwind power zone, which helped us to take one batten off the 12,5 making it an 8 batten 4 camber configuration like on the other sizes. A newly designed head and clew fairings for additional protection of those exposed areas of the Vapor windsurfing sail make the sails much more durable. Our trademark features like C-Film, Radial panel layout, SAS System, new designed tack fairing, all combine to make the 2015 Vapor windsurfing sail in a league of its own. The 2015 Pilot windsurfing sail has all the high grade finish features you expect from a GA Sails product. Keeping the outline as simple as possible, we improved the batten configuration to compact their positioning, incorporating the Stabilized Head design. These new features, along with a revised panel layout (with less panels and also a repositioned luff panel), make our entry level sail even better in all aspects of sailing. From an absolute beginner to more performance-oriented sailors, the Pilot windsurfing sail is a great sail that allows its user to progress and improve their skills. First, we are using the “straight leech” design to keep the rig’s outline as simple as possible. Improved Compact Batten Positioning and a Stabilized Head configuration adds more comfort and control. The revised panel layout creates less seams, whilst we also reinforced the clew area for added protection. Bigger sizes have five battens; 4.5m and 5.0m have 4 battens, and all can be rigged on a 430 mast. We continue to use colored CFilm which offers greater visibility and recognition on the water with a much longer life due the high UV resistance. The Dacron luff panel provides the best solution for a neutral behavior. The Matrix windsurfing sail is our free ride favorite! Each size is equipped with 6 battens and no cams, combining a light gentle rotation with a strong secure skeleton, which will provide forgiveness for the novice rider and exhilaration for the expert. We increased the shape in the front panels, and pushed the center of effort a little higher up and back in the Matrix windsurfing sail to increase the performances in lighter winds. In addition we increased the looseness in the leech at the top of the sail to increase the range. A 6 batten skeleton, with 3 tube battens, makes it stable and powerful, with a wide usable wind range. With so many fine attributes the Matrix windsurfing sail finishes top of her class. Simple plug and play rigging, stable and light handling and a high level of performance rolled into one great sail. For 2015 we made the new design with a “Posi Leech”, which allowed us to make a smaller head area for increased handling. The Compact Batten Positioning and revised panel layout, with less seams, makes the Matrix windsurfing sail lighter in the hands and provides greater control and balance. We adjusted the luff curve and modified the shape in the seams, making the sail fuller, and moved the shape slightly further back in the sail, resulting in a more open leech and greater top end speed. We use a Dacron luff panel, which has increased the smoothness of the sail’s power delivery. Our trademark features such as CFilm in the 2015 version is brighter and more transparent with these new flashy colors. Radial panel layout and a newly designed tack fairing round off the fantastic appearance of this range. The savage windsurfing sail is a high performance no cam free race sail. It has all of the features of a race sail, but in a more user-friendly no cam package. Ideal for those sailors with a real need for speed without wanting the excess baggage of a cambered sail. The savage windsurfing sail gives you everything … and a little extra. Perfectly suited for free race blasting by yourself or equally at home on a slalom course. 7 tube rod battens gives heaps of control and range. A dropped tack that allows it to be rigged further down for a better slot closure. Racing style open leech makes for a more high-end performance-oriented sail than any other normal no cam free ride sail. The narrow sleeve and no cams provide light handling especially when throwing the sail into jibes. For 2015 we made a new design with a Posi Leech, Compact Batten Positioning and a stabilized Head, which makes the Savage windsurfing sail lighter in the hands and more balanced. We added shape in the front panels and a little up higher in the sail to increase the performance in lighter winds. We adjusted the luff curve and opened the loose leech in the top of the sail to increase the range and acceleration. We also reduced the length of the dropped clew, putting it closer to the leech for added stability. Our trademark features such as C-Film make the 2015 Savage windsurfing sail crisper and more transparent, with new flashy colors. A radial panel layout and newly designed tack fairing round off the professional finish of this range, whilst the latest head and clew fairings provide additional protection of the exposed areas of the sail, keeping your sail looking new.